This training program will dramatically boost your race performance in only 14 days. The training program can be used by any cyclist, but riders with a SRM or PowerTap mounted on their bike will get the best value. Whenever you begin a new training program, it is good to know your starting point. It makes it easier for you to track improvements and evaluate your training routine. Before you start training for VO2 max improvements, it is a good idea to do a five-minute all-out test to estimate your average watt at maximum oxygen consumption. There are other tests, but I think this one is so simple, easy to use and very reliable. You can do the test on a stationary bike or on the road if you are the lucky owner of a power meter. Once you have performed a five-minute all-out test, you can begin to train, and when you have trained for a couple of weeks it will be easy to monitor your progress. On Day 1, you will have to do a test to figure out what your starting point is. The best way to do this is to perform a VO2 max test, e.g. five-minute all-out test. Most people can maintain their VO2 max for about 3 to 8 minutes. So a five-minute test will come close to VO2 max for most people. Notice how many watts you can perform. If you do not have a power meter then use an ergometer bike. If power meters or ergometer bikes are not available, then you can perform the test on a track or a steady hill to see how far you can ride in five minutes. But I highly recommend you do some kind of power monitoring. Now it is time for you to enter the VO2 Max Booster Program by performing the 5min test as the first step out of 14 steps to a higher VO2max. Good luck! 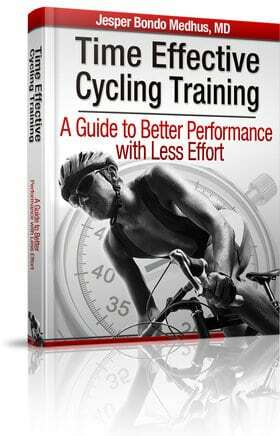 The entire VO2 Max Booster Program is included in my e-book Time Effective Cycling Training. Hi Jesper, I downloaded and read your eBook with great interest but have one very basic question remaining at this stage. In order to determine the V02 max (with a heart rate monitor) I will follow your 5 min all out test approach. Now I am not sure I understand the way to proceed with the test. Can you explain me how to proceed with the 5 min all out test, being warm up time, gear selection, cadence etc.? Also I am using a Tacx Genius and I wonder whether the Anstrand test is a good enough alternative? I did the all the VO2 Max Booster Program and I really feel that it has improvement my performance. Since I don’t have a SRM or PowerTap mounted, I used a RPE – Rating of Perceived Exertion to do the exercises. It was really great! I even post in my blog to share the experience. (https://reconstruindoumaciclista.wordpress.com/2016/06/24/vo2-max-booster-program/). Hi – Should I incorporate any rest days into the 14 day VO2 Booster Programme, or is it supposed to be done over 14 consecutive days ? Do we score the average numbers or max for HR? Also, do we use the same percentages of VO2 max test if we use either HR or Power? Thank you so much for your help Jesper! Hello, is there the e-book also in German writing? I have read your blogs with interest. But now, I have a question..
What is the more meaningful way. 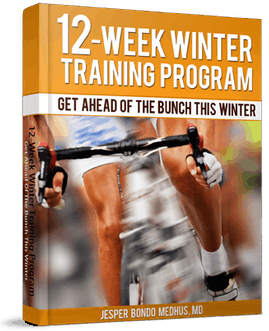 To do first of all the 2 Weeks “VO2max booster program” and then the “12-Week Winter Training Program” or vice versa? I have a race coming up in 3 weeks. Do you think this program is too intense for the next two weeks with a taper week leading up the race? Thanks!!! OMG. I do this in 8 days and some lsd-training in between. Day one on my Neo gives me 492W. So it gets very hard. Even in the warming up blocks i have to go to 375w! Everything went fine except day 7. I had tot take 20 watts less over the whole training and after 60 minutes in the 30/30’s i had to take 10′ recovery spinning to do the rest of the 30/30’s. I’ll let you know if it works on raceday next week 😉 Hope so. Hi Jesper: can you explain the rational for day 7 (1 set of 80 intervals). It appears to be an impossible jump from Day 2 (1 set of 10 @ 30 sec) Day 5 (1 set of 20 @ 15 sec) and Day 6 (4 sets of 5 @ 30 secs). Is it to go as far into the day 7 intervals as possible to failure or was it a programming restriction on Zwift that didn’t provide the space to break up the intervals into 4 sets of 20? Please explain.